A combined computational and experimental study of self-assembled silver-based structures known as superlattices has revealed an unusual and unexpected behavior: arrays of gear-like molecular-scale machines that rotate in unison when pressure is applied to them. Computational and experimental studies show that the superlattice structures, which are self-assembled from smaller clusters of silver nanoparticles and organic protecting molecules, form in layers with the hydrogen bonds between their components serving as "hinges" to facilitate the rotation. Movement of the "gears" is related to another unusual property of the material: increased pressure on the superlattice softens it, allowing subsequent compression to be done with significantly less force. Materials containing the gear-like nanoparticles -- each composed of nearly 500 atoms -- might be useful for molecular-scale switching, sensing and even energy absorption. The complex superlattice structure is believed to be among the largest solids ever mapped in detail using a combined X-ray and computational techniques. "As we squeeze on this material, it gets softer and softer and suddenly experiences a dramatic change," said Uzi Landman, a Regents' and F.E. Callaway professor in the School of Physics at the Georgia Institute of Technology. "When we look at the orientation of the microscopic structure of the crystal in the region of this transition, we see that something very unusual happens. The structures start to rotate with respect to one another, creating a molecular machine with some of the smallest moving elements ever observed." The research studied superlattice structures composed of clusters with cores of 44 silver atoms each. The silver clusters are protected by 30 ligand molecules of an organic material -- mercaptobenzoic acid (p-MBA) -- that include an acid group. The organic molecules are attached to the silver by sulfur atoms. "It's not the individual atoms that form the superlattice," explained Landman. "You actually make the larger structure from clusters that are already crystallized. You can make an ordered array from those." "The self-assembly process is guided by the desire to form hydrogen bonds," Landman explained. "These bonds are directional and cannot vary significantly, which restricts the orientation that the molecules can have." The superlattice was studied first using quantum-mechanical molecular dynamics simulations conducted in Landman's lab. The system was also studied experimentally by a research group headed by Terry Bigioni, an associate professor in the Department of Chemistry and Biochemistry at the University of Toledo. "The hydrogen bond likes to have directionality in its orientation," Landman explained. "When you press on the superlattice, it wants to maintain the hydrogen bonds. In the process of trying to maintain the hydrogen bonds, all the organic ligands bend the silver cores in one layer one way, and those in the next layer bend and rotate the other way." When the nanoclusters move, the structure pivots about the hydrogen bonds, which act as "molecular hinges" to allow the rotation. The compression is possible at all, Landman noted, because the crystalline structure has about half of its space open. "We now have complete control over a unique material that by its composition has a diversity of molecules," Landman said. "It has metal, it has organic materials and it has a stiff metallic core surrounded by a soft material." "We make the small particles, and they are different because small is different," said Landman. "When you put them together, having more of them is different because that allows them to behave collectively, and that collective activity makes the difference." In addition to those already mentioned, Georgia Tech co-authors include research scientist Bokwon Yoon -- the paper's first author -- and senior research scientists W.David Luedtke, Robert Barnett and Jianping Gao. Co-authors from the University of Toledo include Anil Desireddy and Brian E. Conn. This research was supported by the Air Force Office of Scientific Research (AFOSR), and by the Office of Basic Energy Sciences of the U.S. Department of Energy (DOE) under Contract FG05-86ER45234. 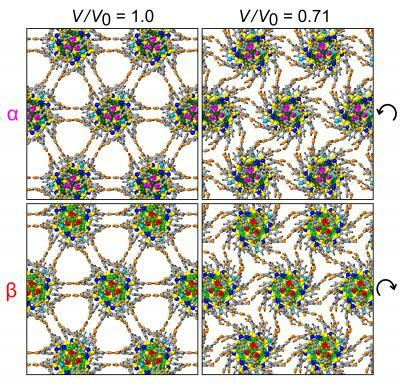 Self-Assembled Silver Superlattices Create Molecular Machines with Hydrogen-Bond "Hinges" and Moving "Gears"